Recently we collaborated with one of Turnkey’s clients on the strategy to launch a crowdfunding campaign to run concurrently with its peer-to-peer events. Crowdfunding and peer-to-peer are different animals. The former is a direct-response outreach; the appeal is made directly by the nonprofit to potential donors. The latter organizes volunteers to raise money on behalf of the organization. The key to getting it right is to understand the differences in the psychology that underlies the two approaches. People who contribute to crowdfunding campaigns and those who participate in peer-to-peer events are motivated by some of the same factors, but they are in vastly different psychological spaces. A major motivator of prosocial behavior generally is what psychologists refer to as “image motivation.” Image motivation is the desire to be seen as a good person, as someone who performs good acts on the behalf of others. In addition to being motivated to have others regard us in this way, we are motivated to feel that way about ourselves. Participating in crowdfunding campaigns is a way to fulfill that desire—for a relatively low cost, I can feel that I am kind, generous, altruistic, etc. An advantage that crowdfunding enjoys is that people can participate (donate) without the expectation of taking on an ongoing commitment. Most times, a donation is framed as a “one and done,” and there is no pressure to contribute to the cause in the future. People will go to great psychological lengths to avoid ongoing commitments generally, and this is true regarding relationships with nonprofit organizations as well. For example, research on the so-called “exchange fiction” describes how people are more likely to donate to charity when they can frame the donation as a financial transaction, like giving in order to get a tax break. The exchange provides psychological cover for their altruistic behavior, absolving them from future involvement. People who are involved in peer-to-peer activities are also influenced by image motivation, but unlike those who donate to crowdfunding campaigns, their continuing engagement is all about their relationship with the organization. Unlike crowdfunding donors, the commitment to the mission over time becomes part of their personal identity. As marketing guru Seth Godin says, they believe that “people like us do things like this.” Their continued engagement depends greatly on the recognition that they receive from the organization, which is powerfully reinforcing. As an example, the “2016 National Awareness, Attitude & Usage Study” surveyed 98,000 multiyear donors to nonprofit cultural organizations. These donors subsequently stopped donating. It was found that people who weren’t acknowledged or thanked for a previous gift were five times more likely to stop donating than those who felt they were asked too often. In ongoing relationships with supporters, like peer-to-peer volunteers, continued engagement with the organization is critical. And the more personal and timely, the better. One thing that is important to provide both to prospects for crowdfunding campaigns and peer-to-peer participants is specific information on how their contribution is (or will be) used, an “impact statement.” For example, “Your donation provided… five days of meals for refugees, six mammograms, a backpack of school supplies for an entire year, etc.” This kind of specific information helps satisfy an individual’s personal image motivation—that they are a good and generous person. The second thing that is important to provide to both groups is a way to publicly “advertise” their donation to friends and family. This satisfies the motivation to be seen as someone who engages in prosocial activities by others. Finally, crowdfunding donors are great prospects for further engagement. People have a consistency bias that pressures them to be consistent in their behaviors over time. Classic social psychological research has demonstrated that people who have done small behaviors (donating $10) are much more likely to engage in larger behaviors (donating $100) to remain consistent. However, it would be wise to avoid any suggestion of future engagement when making an initial crowdfunding solicitation. No one wants to talk about getting married when they’re on a first date. 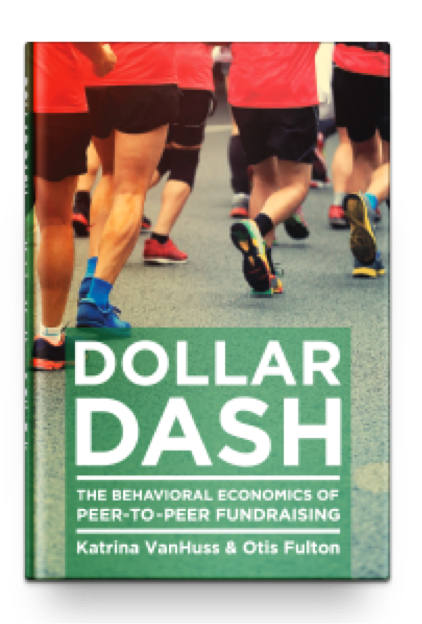 Katrina VanHuss and Otis Fulton have written a book, Dollar Dash, on the psychology of peer-to-peer fundraising. Click here to download the first chapter, courtesy of NonProfit PRO! Is Everyone Getting Social Fundraising Wrong?